Entrust are one of seven providers to be awarded a place on the Department for Education’s (DfE) framework to deliver a fully funded development programme to governors and clerks across England. The programme aims to support Governing Boards to improve the quality of Governance. What is the GovernorSpace programme? An online self-evaluation tool based on the Department for Education Competency Frameworks for Governors and Clerks. A range of interactive training from a suite of titles linked to the competency frameworks. Mentor support to help you complete your Development Plan and support you with any specific needs you may have. Access to GovernorConnect, a database to facilitate peer-to-peer support, and GovernorRecruit, a place to advertise and search for Governor vacancies. The GovernorSpace self-evaluation tool allows you to review your board’s performance against the DfE Competency Framework for Governance. It will provide an overview of the strengths and areas for development to complete a Governance Development Plan, identifying key actions, professional development activities and success criteria. Throughout the process, you will receive one-to-one phone support from one of our trusted experts – many of whom are national and local leaders of education and/or governance and who can evidence the impact they have in schools. The process concludes with the option to revisit the self-evaluation and taking part in a final mentor call, evidencing development in Governance over time and highlighting any remaining development needs. It’s funded by the DfE so is completely free of charge to your school. Can be completed anytime and anywhere there’s an internet connection – whether that’s from your school building during a Governing Board meeting or from the comfort of your home. Provides a tailored service enabling you to follow your own development route selecting the right type of support for you – whether that be training or mentor support. Provides real-time and valuable evidence for Ofsted linked to the Governor and Clerking Competency Frameworks. 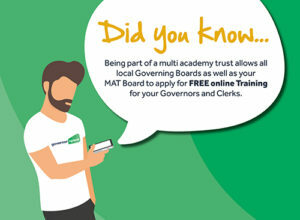 So far, over 2500 governors and clerks have already registered for the GovernorSpace programme. Why not join them – it’s simple to register and is free of charge to your school!